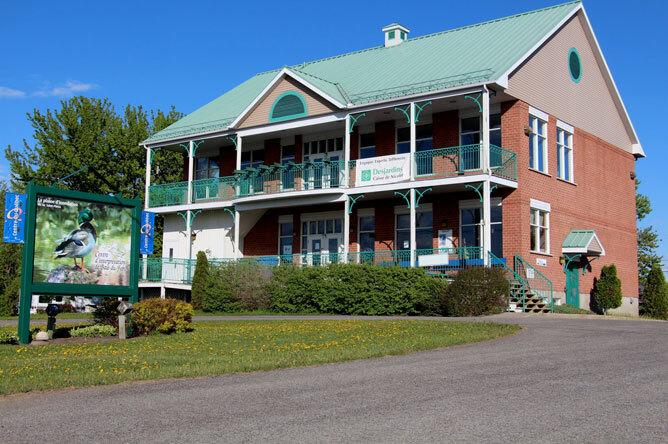 The Centre d'interprétation de Baie-du-Febvre, founded in 1994, teaches visitors about the wetlands of the Lake Saint-Pierre floodplain and raises awareness of the need to protect these habitats. 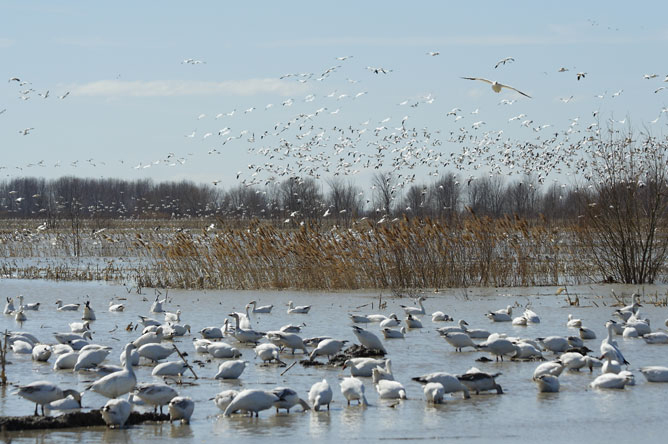 In spring, the Centre focuses on providing information about the Snow Goose migration; in fact, hundreds of thousands of these birds use Baie-du-Febvre as a stopover area each year. 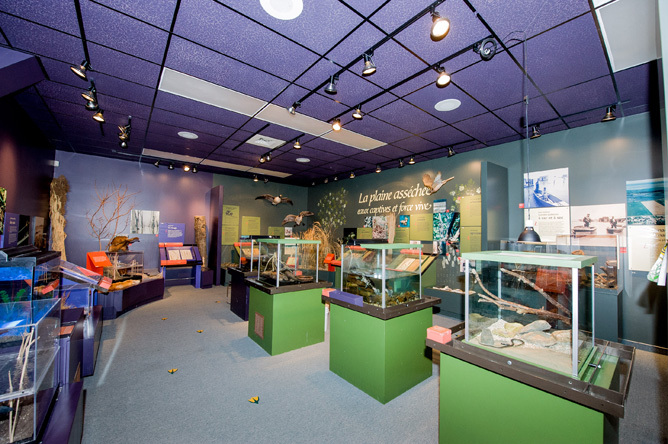 The permanent exhibit uses iIllustrations, photos and models to show how the floodplain changes from season to season. 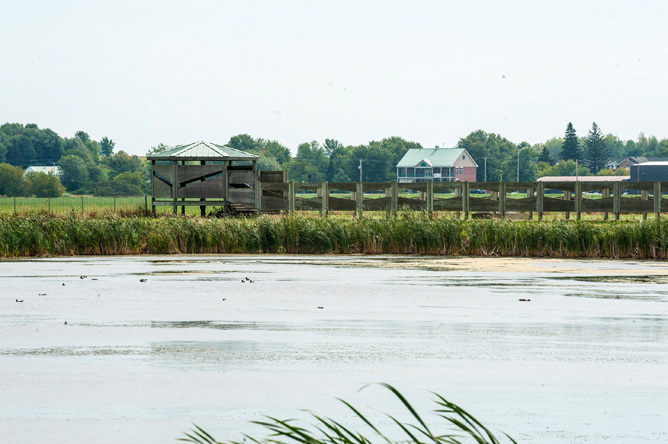 Visitors can hide in a birdwatching blind built on the floodplain in front of the centre to discreetly observe Snow Geese, Canada Geese, numerous species of dabbling ducks and other aquatic birds. This spot is known as a good place to spot the Ruddy Duck; the males of this small rust-coloured duck sport a sky blue bill during the mating season. Four roadside rest areas, an embankment and an observation tower also provide great birdwatching opportunities. 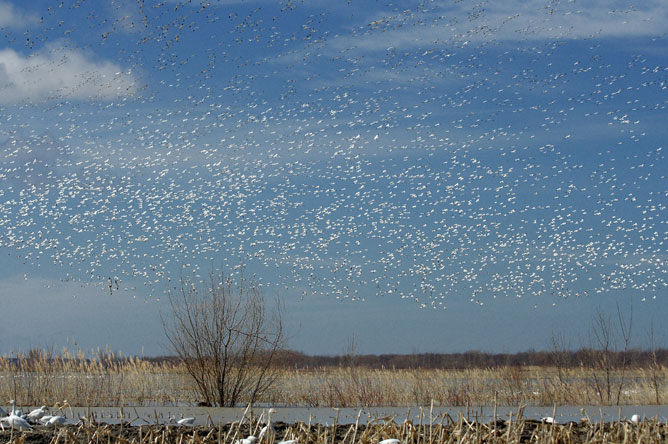 During the spring migration, nearly 400,000 Greater Snow Geese descend upon the floodplain of Baie-du-Febvre. The first geese arrive between late March and early April, depending on that year's weather conditions. The migration generally peaks in mid-April. The geese overwinter on the Eastern seaboard of the United States, and travel 900 kilometres before arriving at Baie-du-Febvre. The geese land in flooded fields to rest, feed and replenish their energy for the next leg of their journey. Their final destination is far north of here: their nesting grounds in the Arctic islands. These geese feed on the roots of aquatic plants. When agricultural practices changed to favour corn cultivation in the early 1980s, the geese adapted and began to feed on corn residue in the fields. These large birds prefer to be near water, where they feel safer from predators. 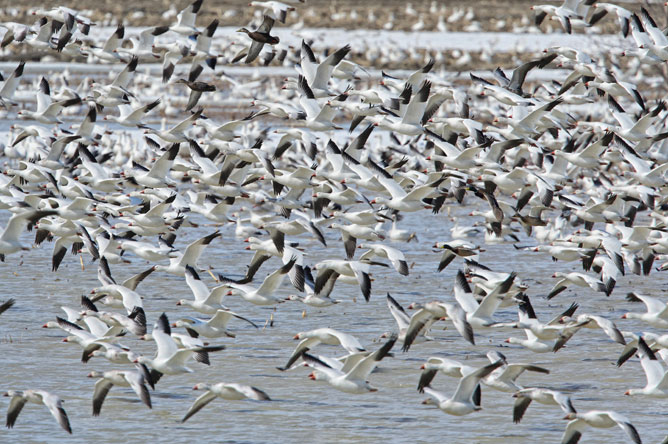 Greater Snow Geese leave the flooded fields of Baie-du-Febvre and Nicolet in early May to reach their nesting grounds. At this point, farmers use pumps to drain the fields. After a few days, seeds can be sow on the now-dry land. 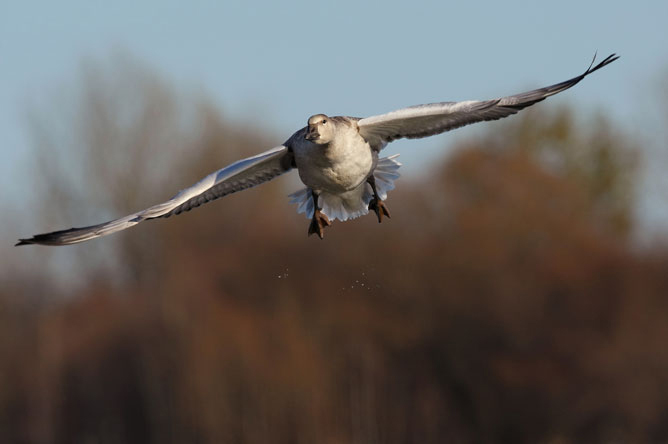 The Greater Snow Goose is entirely white, except for its black wingtips. This majestic bird has become a symbol of the Baie-du-Febvre floodplain. In spring, flocks of white geese fill the skies like white arrows. This is a sign that the long winter is finally ending and warm weather is on its way.